Mennonite Heritage Tour: encounters with women (part 5 of 8). Introduction. Berlin was one of my favourite stops. We did a hop-on-and-off-the-bus city tour and the weather was perfect, sunny and pleasant but not hot, and maybe it’s the sense of accomplishment you get riding the top of one of those double-decker tourist buses, as if you’ve actually grasped the important places, all those sights you’re rolling by. An illusion of course, but a very pleasant one while it’s happening. 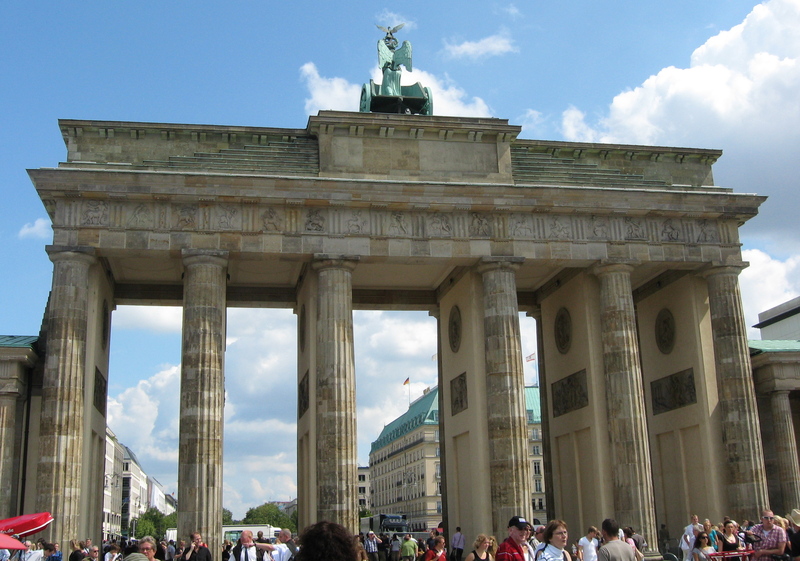 We also roamed on foot around the Brandenburg Gate and Checkpoint Charlie, went into the startling valleys and alleys of the Holocaust Memorial, and had an interesting visit to the roof terrace of the Reichstag Building, with its panoramic views. Berlin seemed to me all energy and confidence. So much of it looked smart and new. We happened to be in Berlin on the day it was commemorating 50 years since the building of the Berlin Wall. On August 13, 1961 — now known as “Barbed Wire Sunday” — Berliners woke to find East German security forces putting up fences and barbed wire barriers along the inner border. The barriers became increasingly impenetrable; the Wall divided a city, neighbourhoods, families. All I felt in Berlin, however, commemoration around us notwithstanding, was the Wall’s absence. And it gives me the strangest feeling somehow – almost akin to envy – that people my age and younger saw and experienced it and I didn’t and now it’s gone. My younger sisters, for example, who travelled around Europe in their youth, well remember crossing the border, seeing it. What’s left now is mostly historical gesture: a short stretch of cement and barbed wire to view as example, memorial flowers, black and white photos, a plaque and a brick line running along the streets to indicate where the “Mauer” had been. Don’t get me wrong. I’m glad the Wall is gone; I cried the day I watched on television as the crowds of people who had gathered broke through it. It’s just that it came up and then came down, and all that Terrible and Good happened in my lifetime! Close enough to touch but I couldn’t really touch it. I touched wholeness and bustle instead. Happiness. Absence. I looked at some of the names on crosses at Checkpoint Charlie which commemorate people who were killed trying to cross the border. Anneliese Walter, one said. Born 19.04.20. Shot at the inner border before the Wall was erected, 28.10.50. 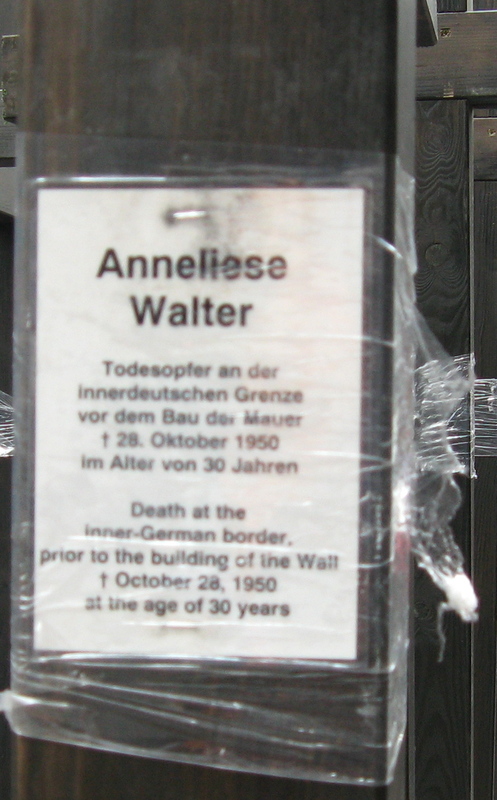 I know nothing else about Anneliese Walter, have no idea why at 30 she needed so desperately to be on the other side. If she were still alive, she would be a little older than my mother is. I know she has a story. But only her name, two dates, and “shot” were there, and we tourists, milling cheerfully about. It was, as I said, just such a marvellous day. 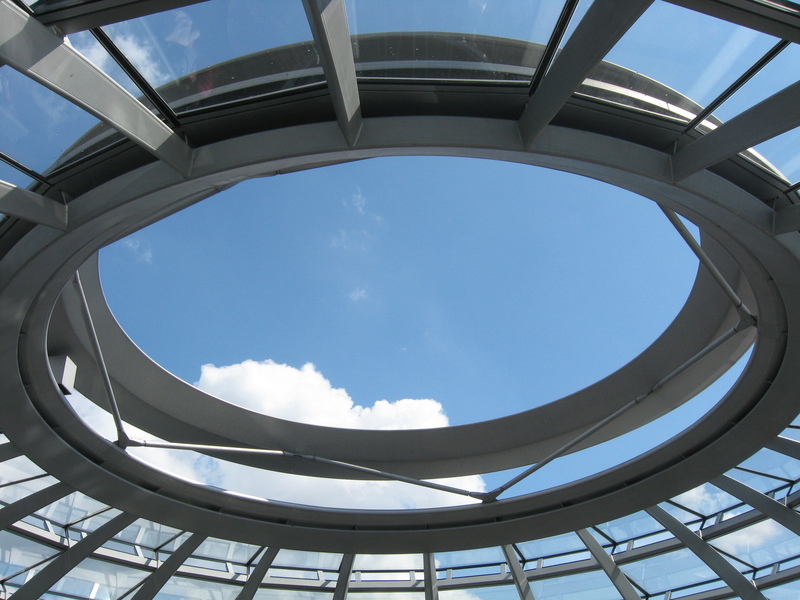 View from rooftop terrace of the Reichstag building. This entry was posted in Personal, Women's lives and tagged August 13 1961, Berlin Wall, Mennonite Heritage Tour by doradueck. Bookmark the permalink.